Roasting salmon filets and broccoli florets on the same pan results in a low-effort, high-payoff dinner that's ready in under half an hour. The salmon is coated in a tasty combination of mustard, fresh rosemary, maple syrup and cayenne for a tangy, slightly sweet sauce that infuses the fish with flavor. Roasting the broccoli with a little olive oil results in crisp-tender florets with just the right amount of char. And it is paleo friendly! Serve this easy one-pan meal with a side of farro, quinoa or brown rice for a healthy dinner. Fresh thyme, oregano or tarragon are wonderful substitutions for rosemary. Tangy mustard and maple syrup are natural companions, but you could also try other sweeteners if you prefer. Substitute the syrup with honey or brown sugar for a different flavor. Per Serving: 595 calories; 36g fat; 13.3g carbohydrates; 54g protein; 143mg cholesterol; 707mg sodium. i used all dijon because i dont like whole grain. i think that made it too strong, still really good but the mustard overwhelmed the salmon a bit. This tasted great. I love salmon with a bit of sweetness and the maple syrup does just that without overpowering the mustard. 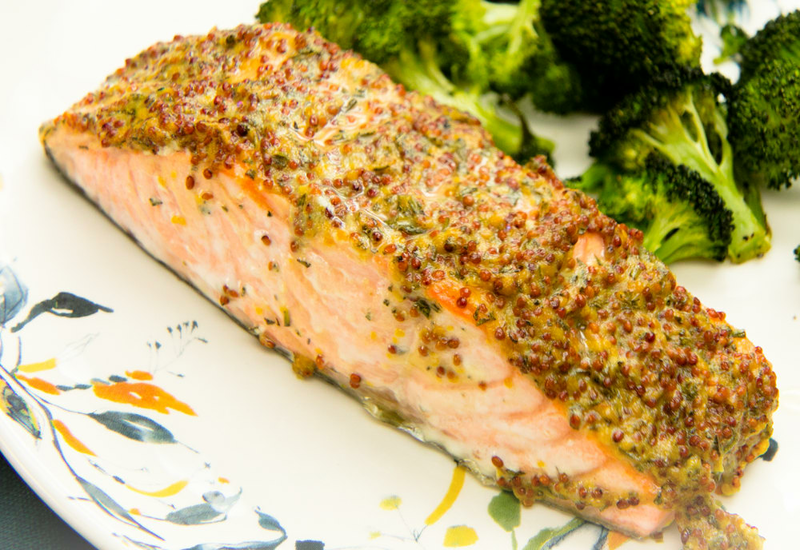 I bet you could swap honey for the mustard and turn this into a honey dijon salmon recipe! Super easy and low carb! I added garlic and red pepper to spice things up. This recipe is so good! I love that's it's easy to make and quick. I substituted the Dijon-style mustard with Creole mustard. Next time, I'm going try the salmon and broccoli over brown rice and make a bowl for my weekday meal prep! I don't have whole grain mustard but I did use my spicy mustard to make this. It was delicious. I also did asparagus instead of broccoli. This is one of my favorite sheet pan dinners!